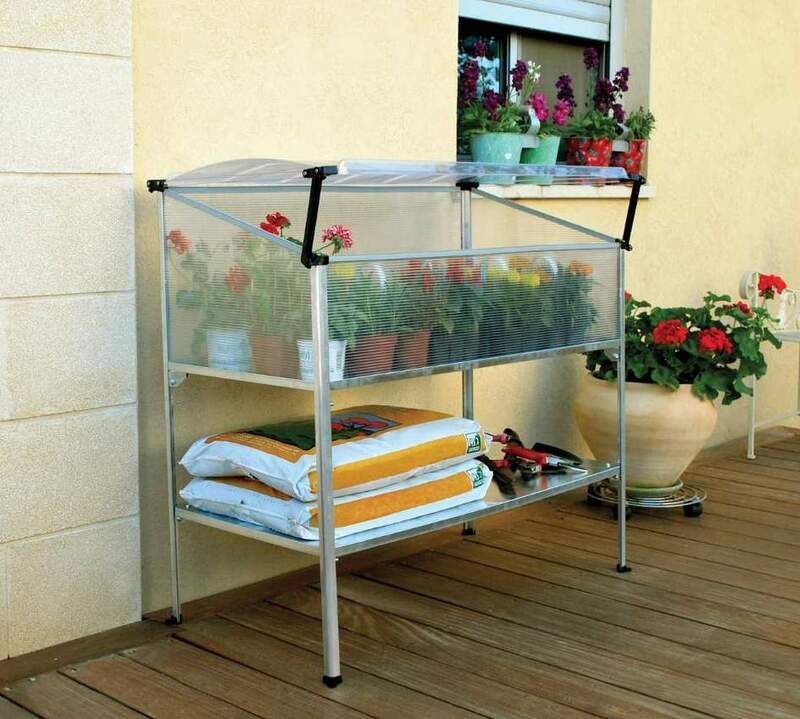 The Grow Deck mini greenhouse from the Silver Line range is a great solution if you are looking for a neat, compact unit to grow smaller flowers and vegetables or to propagate plants in space-restricted areas such as balconies, patios and small courtyards. With its robust aluminium extrusion frame, galvanised steel shelves and glazing of virtually unbreakable polycarbonate, the Grow Deck mini greenhouse is sturdy and easy to access. The clear polycarbonate lid can be set open to allow ventilation during the day, opened fully to allow access and when closed will protect your plants from wind and low temperatures. The Grow Deck also provides protection from birds and pets. The elevated greenhouse deck gives easy access – you don’t have to get down on your hands and knees to look after the plants. The shelf beneath the greenhouse section is adjustable and can be used to store bags of potting mix, fertiliser, garden tools and gloves. The Grow Deck mini greenhouse is supplied as an easy to assemble kit. Greenhouse gardening is becoming increasingly popular in today’s high-pressure environment. Many people are finding that the process growing and looking after plants is a great way to relax as well as useful source of fresh produce. The Grow Deck is particularly suited to growing smaller plants such as herbs – other units in the Silver Line range can be used for plants requiring deep pots or needing plenty of room for height.